Update: the mysterious and inimitable Len9 has updated the excellent Mortmain Reaktor Resource page with fresh links to ensembles, tutorials, general information and utilities. His page has been around since I first took an interest in Reaktor years ago and with this update it’s still the best one page overview of everything Reaktoriffic on the net. Now that the great Reaktor $99 sale of 2013 is over we have a nest of new Reaktor hatchlings that require feeding! This is a couple of pointers to great ensembles in the user library. Your first stop should be the all time top 100, where you’ll find goodies like ZooTook’s Synth In A Case, the venerable but still worthy 3X by James Walker Hall, and the Morphing Minimal Drum Machine by Martin Brinkmann. When you’re on the page of a particularly good ensemble, make sure to click on the author’s name for a list of everything they’ve done in the library, and don’t just sort by user rating – Martin Brinkmann in particular has a lot of really interesting ideas implemented in older ensembles that aren’t highly rated. Do get MadPad. You will want to collect the ensembles of Rick Scott and Dieter Zobel. It’s awesome how much the character of the builder can come through in Reaktor ensembles and they offer many examples of this. Especially check out some of the older Zobel contraptions, like Pole-Onaise which I remixed into Dubby Red Planet. Another gorgeous Zobel joint is Locutus II and don’t forget Haemotherapy (both versions). Locutus and Haemotherapy are in my top 5 Reaktor ensembles of all time for their weirdness and individuality. A whole whack of great uploads can be yours free, courtesy of Sonictwist! (who went on to found Twisted Tools). Get’em all! Intermediate to advanced builders will appreciate the ability to build their own modulars with click-to-connect front panels courtesy of Hervig Krass. Noobs can enjoy his finished instruments and example modulars. Around the net, don’t miss the great instruments and effects of Boscomac. Finally, when you’re looking for a simple and direct granular sampler that cuts through the usual bells and whistles, check out my own Frame 3. This is a quickie thumbnail sketch of a few ensembles that stand out in my mind but there are many, many more… I know I’ve neglected many great builders, and if you have favorites of your own I haven’t mentioned, please leave a link in the comments! Happy exploring, downloading, building and music making. Update: bftucker from the KVR forums provided a link to this PDF from Simon Hunt that describes a wide range of user ensembles classified by type – granular, effect, beat sequencer, etc. A little old but that’s cool because it probably has a lot of stuff that’s slipped off the radar by 2013. Update 2: Can’t believe I forgot Antonio Blanca’s superb Dron-e.
Update 4: Thanks to Ronnie from Rekkerd, three more suggestions: Rubiter Ate, Concept X and Fourious plus Fourious 2000. To which I will add, check out the other synths by Paul Woodroffe and Stephan Becker too. Soon you’ll have a formidable armada of great sounding and unique synths. This entry was posted in Downloads, Ensemble, ensembles and tagged boscomac, Dieter Zobel, instrument, instruments, Martin Brinkmann, reaktor, Rick Scott, Sonictwist, User Library, ZooTook on June 29, 2013 by peterdines. After some hemming and hawing I pulled the trigger on this today – very happy so far! The sliders are much less dodgy than I’d been warned by some people, very usable actually. I’m still fiddling with sensitivity and touch technique. Tip: if you want one of the vertical sliders zeroed, press and release right at the bottom instead of sliding down to that point. I’ve been experimenting with mapping filter cutoff, the most obvious parameter, to one of the faders and found you can do a nice tremolo effect by rolling your finger back and forth across it. Edit: the finger roll technique works super well to adjust values in general, not just for vibrato. Nice smooth transitions. Set your finger vertically across the vertical sliders, horizontally across the horizontal ones, and roll, roll, roll your way to fitness. Edit 2: one of the cool things about the slider / faders is, the way the LEDs are staggered and use variable brightness gives you a more accurate than expected idea of what values they represent.Sorry for liveblogging – this is exciting! Will def have to make a more minimal preset, then start bringing in more controllers as they become necessary or desirable, because my goodness does it sends a lot of stuff by default. The editor software is intelligent enough to select and alter a bunch of controls at a time which is nice. And it was easy to change a drum pad preset to use different banks with one of the up and down arrow pairs. Build quality and overall feel are great. Plus by default it doesn’t have every single light lit up like in the pictures, so it’s easier on the eyes. Next step is to figure out how to use the rotary controllers to set sample start and loop length in Loupe 2. 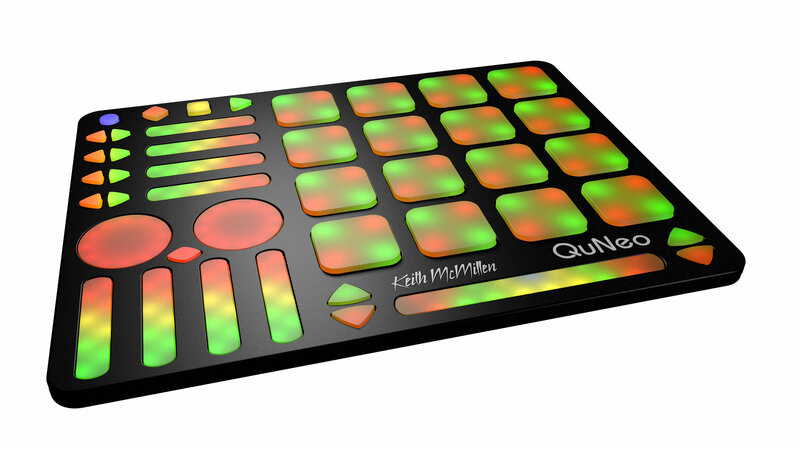 This entry was posted in Uncategorized and tagged controller, drum pad, keith mcmillen, MIDI, pad controller, quneo on June 28, 2013 by peterdines.